PONSHOP Studio and Gallery is pleased to announce our 14th community art exhibition in August and September of 2018. “Remixed 6” features original artwork using 12” vinyl record albums. The exhibit includes over thirty participating artists work on this unconventional canvas. The opening reception for September's “Remixed 6” Exhibit will be Friday, September 7 (6-9pm). *Due to popular response, we've "Held Over" our Call for Artists. Artists can still participate in September's Exhibit. Click Here to Register. This is the sixth year of the “Remixed” vinyl-themed show and PONSHOP has received an overwhelming response from local artists. As of this press release, the gallery has issued over thirty albums to be adorned by over twenty artists. This community art show has proven to be a great addition to the gallery’s exhibition schedule, involving artists of all backgrounds and also boasting affordable artworks for the home or office ranging from $25-$150. “Remixed 6” is curated by gallery owners Scarlett and Gabriel Pons. PONSHOP Studio is excited to announce our 14th community art exhibition in August and September of 2018. We’ve rescued stacks of old 12” vinyl records, wiped the dust off and, with artists help, will turn them into something that people will continue to enjoy—a fun and original work of art. “Remixed 6” is the sixth annual vinyl album art show at PONSHOP and our most popular annual community exhibit. All ages and skill levels are invited to participate in this two-month show. Submission Requirements: All artists must use the pre-mounted vinyl albums that we provide and all work must be for sale. Submit your best work! The gallery reserves the right to reject artwork based on quality: uniqueness and creativity, craftsmanship, and execution. Entries must be original creations of the artist – no reproductions of others artwork. Entry Conditions: All artwork must be for sale. Artwork cannot have a retail price exceeding $150. PONSHOP retains 50% of all sales on works exhibited throughout the duration of the exhibit. Artists will be reimbursed within 30 days of the exhibition closing. Artists are responsible for acquiring insurance on their own artwork. Although PONSHOP will take great care in the hanging and display of artwork, the gallery will not be held responsible for items on exhibit. Artwork delivered after Sunday, July 29 will NOT be accepted. Artwork delivered that is not dry, of poor assembly, is incomplete, or exceeds the boundaries of the vinyl record (see diagram below) will NOT be accepted. Artwork picked up after Friday, October 5 will incur a storage fee of $10 per day. This will be enforced. Artwork not retrieved by October 10 becomes property of PONSHOP. Entry Procedure: There’s an entry fee of $18 per vinyl album, with a limit of two submissions per artist. Artists may register online or pay the entry fee at our storefront to receive their ready-to-hang record. The gallery will not ship records to prospective artists. Delivery: Artists are to complete the Entry Form and return it with finished artwork by Sunday, July 29. Artwork must have entry tabs securely taped to the back of the corresponding record. Artists are responsible for transporting their work to and from the gallery. PONSHOP Studio and Gallery is pleased to announce their tenth community art exhibition in August of 2017. 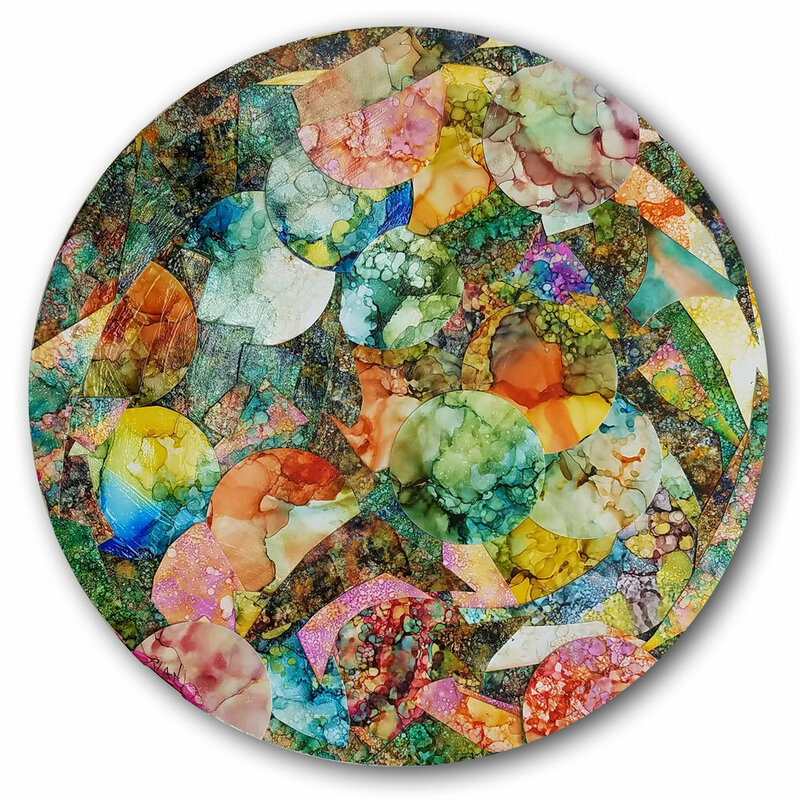 “Remixed 5” features original artwork using 12” vinyl record albums. The exhibit includes over fifty participating artists work on this unconventional canvas. The opening reception for “Remixed 5” will be Friday, August 4 (6-9pm). This is the fifth year of the “Remixed” vinyl-themed show and PONSHOP has received an overwhelming response from local artists. As of this press release, the gallery has issued over seventy albums to be adorned by over thirty-five artists. This community art show has proven to be a great addition to the gallery’s exhibition schedule, involving artists of all backgrounds and also boasting affordable artworks for the home or office ranging from $25-$150. “Remixed 5” will be curated by gallery owners Scarlett and Gabriel Pons. The First Friday Reception will include “Vintage DJ” services by Raven Hi-Fi, spinning tunes using a classic turntable setup. PONSHOP’s garden space will boast an outdoor pop-up Listening Booth by The Record Mann Archive. All are invited to celebrate in the art of vinyl. Featured artists include Jenna Andersen (Williamsburg, VA), Anna Martin, James Walker (Leesburg, VA), Samantha Brodek (Richmond, VA), Maddie Huddle (Fredericksburg, VA), and Martin Reamy (Richmond, VA). PONSHOP Studio is pleased to announce our tenth community art exhibition in August of 2017. We’ve rescued stacks of old 12” vinyl records, wiped the dust off and, with your help, will turn them into something that people will continue to enjoy—a fun and original work of art. “Remixed 5” is the fifth annual vinyl album art show at PONSHOP. All ages and skill levels are invited to participate. We encourage all participating artists to join us for the opening reception on August 4. Entry Conditions: All artwork must be for sale. Artwork cannot have a retail price exceeding $150. PONSHOP retains 40% of all sales on works exhibited throughout the duration of the exhibit. Artists will be reimbursed within 30 days of the exhibition closing. Artwork delivered after Sunday, July 30 will NOT be accepted. Artwork delivered that is not dry, of poor assembly, is incomplete, or exceeds the boundaries of the vinyl record (see diagram below) will NOT be accepted. Artwork picked up after Friday, September 1st will incur a storage fee of $10 per day. This will be enforced. Entry Procedure: There’s an entry fee of $15 per vinyl album, or $40 for three albums with a limit of three submissions per artist. Artists must pay the entry fee at our storefront and receive ready-to-hang records at PONSHOP at time of purchase. The gallery will not ship records to prospective artists. Delivery: Artists are to complete the Entry Form and return it with artwork by Sunday, July 30. Artwork must have entry tabs securely taped to the back of the corresponding record. Artists are responsible for transporting their work to and from the gallery. PONSHOP Studio is pleased to announce their eighth community art exhibition in August of 2016. “Remixed 4” features original artwork using 12” vinyl record albums. The exhibit includes over fifty participating artists working on this unconventional canvas. The opening reception for “Remixed 4” will be Friday, August 5 (6-10pm). This is the fourth year of the “Remixed” vinyl-themed show and PONSHOP has received an overwhelming response from local artists. As of this press release, the gallery has issued over 80 albums to be adorned. This community art show has proven to be a great addition to the gallery’s exhibition schedule, involving artists of all backgrounds and also boasting affordable artworks for the home or office ranging from $25-$200. “Remixed 4” will be curated by gallery owners Scarlett and Gabriel Pons. Participating artists include Diego Pons, Patricia Atkinson, Yanina Angelini, Amy Bayne, Sharon Blanchard, Morgan Buenos, Maddie Huddle, Newell Jones, Kay Portmess, Tim Rodgers Jr., Andrew Ruddle, Rachel Ruddle, Dolly Whitley, and many more. PONSHOP Studio is pleased to announce their sixth community art exhibition in August of 2015. “Remixed 3” features original artwork using 12” vinyl record albums. The exhibit includes over fifty participating artists working on this eccentric canvas. The opening reception for “Remixed 3” will be Friday, August 7 (6-10pm). In keeping with the show’s theme, DJ Moog will be spinning on the turntables in the garden space of the gallery. This is the third year of the “Remixed” vinyl-themed show and PONSHOP has received an overwhelming response from local artists. As of this press release, the gallery has issued over 85 albums to be adorned. This community art show has proven to be a great addition to the gallery’s exhibition schedule, involving artists of all backgrounds and also boasting affordable artworks for the home or office ranging from $25-$200. “Remixed 3” will be curated by gallery owners Scarlett and Gabriel Pons. PONSHOP Studio and Gallery is pleased to announce their fifth community art exhibition in August of 2014. 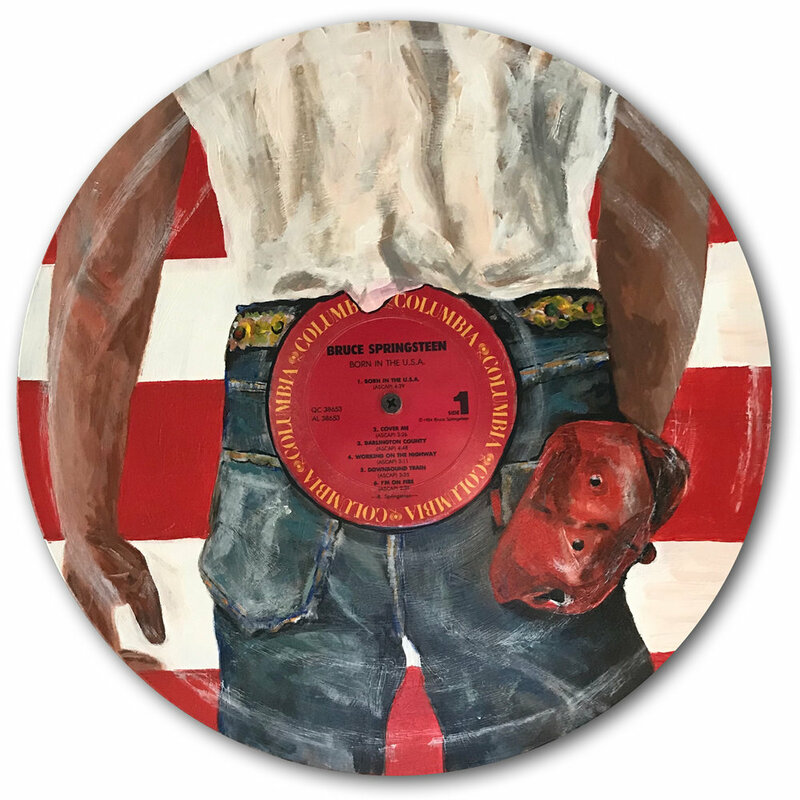 “Remixed 2” features original artwork using vinyl record albums. The exhibit includes thirty-five participants and ten featured artists (as of this press release). The opening reception for “Remixed 2” will be Friday, August 1 (6-10pm). Last year’s event was met with great enthusiasm from the arts community. The show boasted over 60 entries from over twenty-five local and regional artists. Gallery owner Gabriel Pons has been using 12” vinyl records as his canvas for four years. When a friend offered him a crate of old records, he saw the potential of using the standardized discs in an art show where each participant “repurposes” the old albums and turns them into art. Both Scarlett and Gabriel Pons are excited to see how each artist treats this design challenge. The opening reception will include music provided by Mike DJ, with desserts by Morsels & Moonshine and refreshments by Creative Juices. Kelly Fortuna, Sharon Blancard, Sidney Mullis, Elizabeth Carter, Alicia Hurst, Kelly Penick, Perri Chuska, Maddie Huddle, Deb Yarrington, Meredith Lackie, Robert Wayne Luther, Maie Makin, Morgan Buenos, Curtis Cataldo, Erica Anderson, Jake Argarin, Stacey M Schultze, Martin Reamy, Mirinda Reynolds, Carol Coffman, Sam McCown, Sue Connors, Caroline Connors, Jürgen Brat, Hannah Doepp, Brooke Kingsley, Lauren Horton, Adam DeSio, Mika Zink, Tanya Green, Diego Pons, Gabriel Pons and Rebecca Maurer. PONSHOP Studio and Gallery will be hosting its fifth community art exhibition in August of 2014. We’ve rescued stacks of old Christmas records, wiped the dust off and, with your help, will turn them into something that people actually enjoy– a fun work of art. 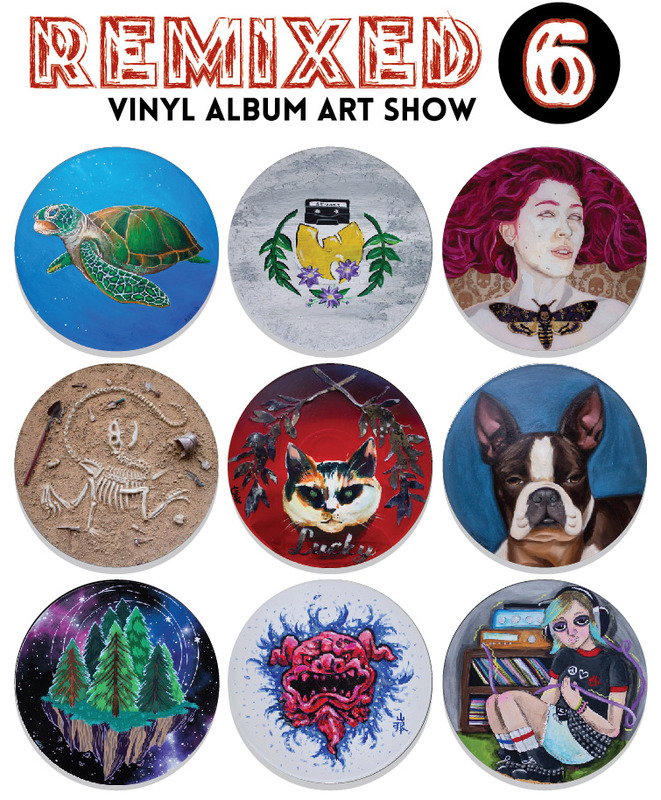 "Remixed 2" is a follow up to our "Remixed" Vinyl Album Art Show in June of 2013 which included over sixty vinyl albums from over 25 participating artists. Click Here for the Complete Prospectus and Entry Form. Here’s how the show works: once you pay the entry fee, we provide you with up to three ready-to-hang vinyl albums (the fee is $12 per record, or $30 for three). You have until July 27 to turn your Jane Fonda Workout album into a work of art, which will be exhibited throughout the month of August. The theme and medium are up to you, but there is one rule: each record is mounted on wood block with hanging wire and must stay mounted in order to be suitable for display on our gallery walls. This exhibit is open to all artists (professional and emerging) in the Virginia/DC/Maryland Region. PONSHOP retains 40% of all sales on works exhibited throughout the duration of the exhibit. Artists will be reimbursed within 30 days of the exhibition closing. Artists are responsible for acquiring insurance on their own artwork. Although PONSHOP will take great care in the hanging and display of artwork, the gallery will not be held responsible for items on exhibit. Entry fee: $12 per vinyl album, or $30 for three (up to three submissions). Artists pay fee and retrieve ready-to-hang vinyl albums from PONSHOP. Please complete entry form when returning the work. Deadline for Submissions: Saturday, July 26 (10-6pm) Sunday, July 27 (noon-5pm). *Please Deliver ONLY between Friday July 25 and Sunday the 27th.